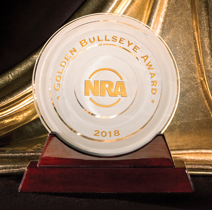 About the award – Each year the editors of American Hunter present Golden Bullseye Awards for product or service achievement each year during the NRA Annual Meetings & Exhibits. Now in their 16th year, the NRA Publications Golden Bullseye Awards acknowledge the finest products available in the shooting sports. The winners are selected by a seven-member committee consisting of editors, graphic designers, and veteran NRA Publications staff, representing more than a century of collective experience in the shooting and hunting industry. About the rifle – The B-14 Hunter rifle features a molded synthetic stock made of glass fiber reinforced polymer. As with the entire B-14 Series, the Hunter brings Bergara accuracy to a line of hunting rifles that is affordable to serious big-game hunters. Built in Spain at our highly automated and efficient factory, this rifle delivers a level of quality and performance that is unmatched in its price range. The world-renowned Bergara barrel on this rifle for hunting whatever your heart desires is complemented by our own super-smooth B-14 Action, which is a two-lug system with a sliding plate extractor and a coned bolt nose and breech to ensure a smooth feeding and extraction of the cartridge. It’s also outfitted with a Bergara adjustable, curved trigger which we designed to guarantee a crisp, clean pull every time you fire the rifle. The trigger comes set at about three pounds. The Hunter is available with either a hinged floor plate or a detachable magazine. It has been factory drilled and tapped to fit Remington 700 style rings and bases. The (#3) Bergara 4140 CrMo steel barrel is finished in matte blue and is available in 22 inches in the short action, which weighs 7.05 lbs. and 24 inches in the long action, which weighs 7.35 lbs. Our stocks are bedded with integral pillars for stability and enhanced accuracy. During the molding process, solid steel pillars are inserted and permanently molded into place, providing a secure and stable bedding surface for the barreled action. The base color is green with tan and black flecks, providing a very tasteful camo look. A SoftTouch coating gives the stock a soft, tacky feel that is easy to grip even in harsh weather. The Bergara B-14 Hunter is available in a variety of calibers – .22-250, .243 WIN, 6.5 Creedmoor, .270 WIN, .308 WIN, 7MM REM MAG, .300 WIN Mag, and.30-06 SPRG.